Lemon curd is a dessert spread and topping like a velvety custard, usually made with citrus fruit, zest and juice of lemons or even limes, oranges or tangerines, butter, eggs, corn flour (starch) and sugar. It can be eaten as it is, or served as a spread on bread or biscuits or as a filling for pies, tarts or cakes or even in a Greek Galaktoboureko! I have also made it with oranges. I love the taste of lemon and I have been wanting to make lemon curd for ages. However, butter and eggs was the reason that kept me from making it. However, even if I have been avoiding eggs and butter as much as I can, I still want to make a few things at least once and since I could not avoid the eggs, I used a becel proactive margarine (which is supposed to lower cholesterol levels) instead of using butter. When I went to the supermarket I bought some lovely organic lemons, especially for this reason. I google searched to find more about how to make it. I read a lot of recipes but in the end, since I understood the concept of the recipe, I made it my way, just as we make avgolemono sauce. I boiled the lemon juice and put the remaining ingredients in a bowl, which I whisked with a hand mixer. I thenmadded the hot lemon juice to temper the eggs. I poured the mixture back in the pot I heated the lemon juice and mixed until it set. I let it cool for a while and then incorporated the butter, a little each time. I don’t like wasting anything, especially when it involves lemons. So, the first time I made it, before cutting and squeeing out the lemon juice, I peeled the lemons and used them to make candied lemon peels. This year our lemon tree gave us the first seven wonderful large lemons, which of course are organic. Here you can see our lemons compared to an ordinary lemon and compared to an orange. The peels are nice and thick so they are already being made into a fruit preserve. Recipe will hopefully be posted soon. Yesterday I used some of the juice and zest to make the lemon curd. This time I used butter as I have stopped using margarine a long time ago! This time, I used the zest to make limoncello. Zest the lemons with a box grater and then juice them. Put the lemon juice in a pot and bring to a boil. Put the eggs, sugar, corn flour and lemon zest in a bowl and whisk with a hand mixer to combine. Add the hot lemon juice to the mixture and keep mixing in order to temper the eggs. Transfer the mixture back in the pot and using a balloon whisk, mix continuously until it sets. Set aside until it becomes lukewarm (about 5 minutes). Cut the butter into smaller pieces and add it a piece at a time, mixing until incorporated and continue until all the butter is added. Cover with cling film (so that a skin doesn’t form) and refrigerate for up to a week. Lemon curd is a dessert spread and topping like a velvety custard, usually made with citrus fruit, zest and juice of lemons or even limes, oranges or tangerines, butter, eggs, corn flour (starch) and sugar. It can be eaten as it is, or served as a spread on bread or biscuits or as a filling for pies, tarts or cakes. Cover with cling film (so that a skin doesn't form) and refrigerate for up to a week. Using a vegetable peeler, remove peel from lemons in long strips (yellow part only). Place in a pot and add enough cold water to cover them. Bring to boil, drain and repeat blanching 2 more times. Bring sugar and water to boil in another pot, stirring until sugar dissolves. Add lemon peels and simmer for about 20 minutes or until soft. Using a slotted spoon, transfer peels to the prepared sheet. Sprinkle 1 cup sugar over and toss to coat. Let dry at room temperature for a few days, mixing regulary. Transfer candied lemon peels to an airtight container or in a jar. Store peels at room temperature. Pour leftover syrup into a clean sterilized jar and store in the refrigerator for future use. It can be used to wet sponge cakes, biscuits to be used in desserts or in any other recipes using syrup. Leftover sugar used to coat lemon peels can be used in other desserts. When boiling the lemon peels, you may use the third lemon water to boil and flavour rice. The lemon curd may be stored in sterile jars up to a week in the refrigerators. 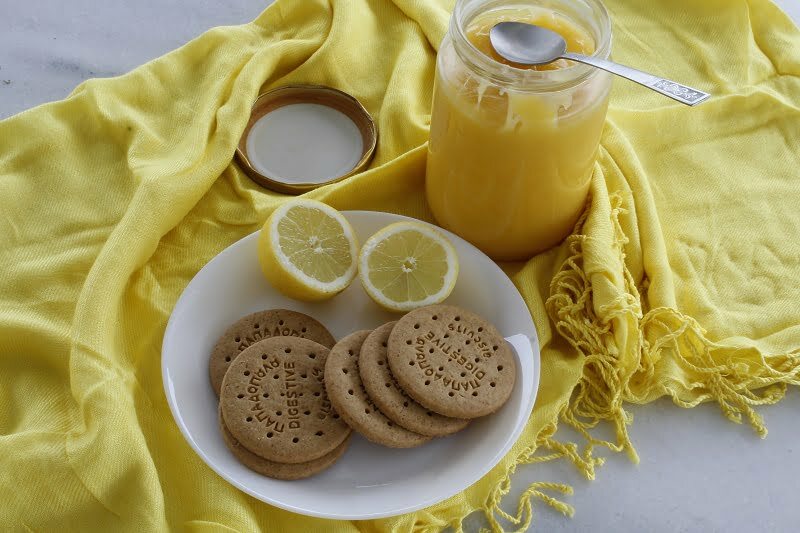 A few uses of lemon curd are: on bread and toast, just like we use jam, in tarts, between biscuits, on pancakes, to glaze cakes or thinned down as a sauce. Below you will find a few recipes using these ingredients. My cookbooks “More Than A Greek Salad”, and “Mint, Cinnamon & Blossom Water, Flavours of Cyprus, Kopiaste!” are both available on all Amazon stores. Thanks, Ivy, for sharing this lovely lemon curd recipe. i never made lemon curd…i will try with your recipe!thank you,ivy! Great recipes! I particularly love the flavor of lemon… Lemon curd is one of my favorite spreads! Great recipes Ivy…lemon curd is a real sweet treat! Thanks for sharing! Good tips Ivy, I really like the idea of using the boiled water for lemon rice…NOTHING is wasted! Mmm…love lemon curd, especially on gingerbread. The lemon faces remind me of a Play with Your Food calendar I have, too cute. Lemon is my favorite. Always a very fresh flavor. Your lemon curd looks divine! I know I would really enjoy this intense lemon treat. I’ve wanted to make my own lemon curd too! I bet this was delicious! Love the lemon peel too. Good morning & Kalo Mina Ivy! I love, love, love lemon curd. I’m baking all of my favorite lemon recipes regularly now because our lemons are ripe. I wish that you were my neighbor because I’ve already given hundreds of lemons away and you’d definitely be on the receiving end! Ivy, that is a great post!…love all the recipes! I made lemon curd once and it was a bit too runny so now i am a bit worried to make them. Love the lemon curd and the other ideas sound wonderful! The candied peels sound delicious Ivy. I have made lemon curd but never lemon peels. I would like to try this. Candied citrus peel is high on my list of things to try: thanks for the pointer. I am just waiting for the new crop of citrus fruit. I love lemon curd. It is great on toast and I’ve also filled cupcakes with it! It gives an interesting surprise when you take a bite! I might have to try the candied peel when there is an abundance of lemons in the garden. I have to try to make both the curd and the peels. I love lemon curd in pastries and the peels are the jewels. Don’t know why I don’t make them.